Imagine having the worst day of your life then turning it up to the max level possible; what do you think would happen? Chaos perhaps, or shall we say Mayhem? Director Joe Lynch (Everly) brings us a story of hell in the office with gleefully dark humor and bloody violence to satisfy during all the carnage in his latest film. Screenwriter Matias Caruso (Numbers) makes use of his smart script to give us interesting characters, brutal violence that horror fans will no doubt enjoy, and a peppy soundtrack that will have you smiling throughout the course of the mayhem. It all starts with a voice-over narration from the man that we follow Derek (Steven Yeun, The Walking Dead) and what life is like at his consulting office. He IS excited to work for this company but soon realizes that the job is taking over his life. Meanwhile, a virus is exposed to the workforce which causes anyone who comes into contact with it to become homicidal and have the “Red Eye” appearance, hence the name of the contagion. We are given an introduction to how the virus works which at this point is something we should be paying attention to, because sooner or later, it’s bound to happen at this office. Derek gets into trouble at work, he loses his treasured coffee mug, he has to deal with a client named Melanie (Samara Weaving) and his boss John Towers (Steven Brand) who is someone that we wouldn’t want to deal with on a daily basis. It’s not long when the pathogen is found in the building and co-workers are showing signs of infection, that “red eye” is starting to become noticeable. As you can imagine, chaos reigns down the halls while Corporate looks down from above all safe and sound. 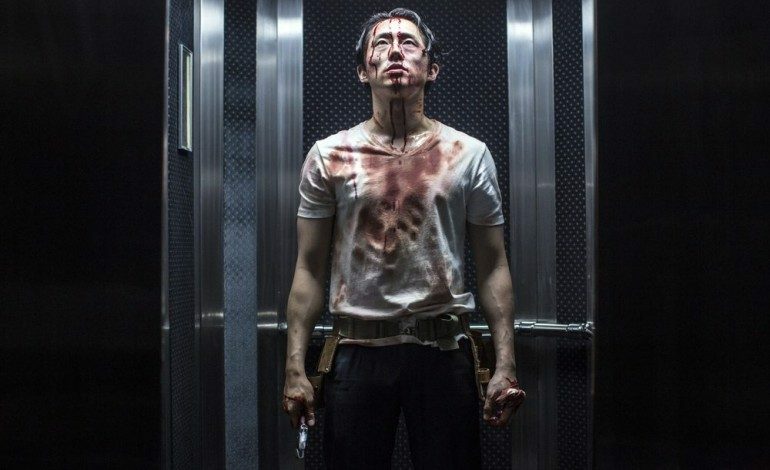 Steven Yuen was a great side-kick in The Walking Dead and here his performance is well worth watching. He’s pissed off and funny as hell all amid the chaos in the office. The supporting cast does very good work here too. Plus, the tension-filled violence is a fun time to watch. Be warned, Mayhem is a very violent film, but one that is hilarious, tells an interesting story between corporate greed and the relations between their fellow employees. Lynch handles the film is a way that works way better than The Belko Experiment and is satirical enough to keep us glued to our seats while the film plays out. From its clever premise, wacky soundtrack and moments that will make you smile and look away at the same time Mayhem is a roller-coaster ride well worth experiencing.